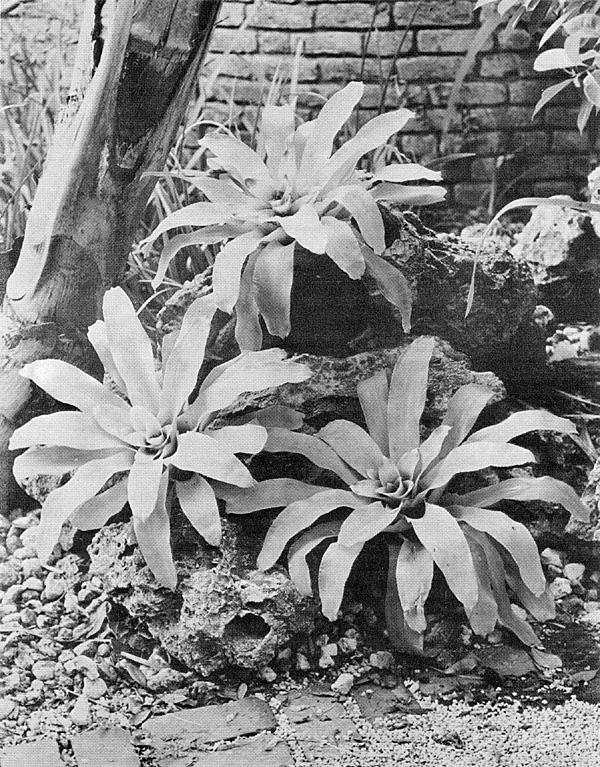 The Bromeliad Society Bulletin is the official publication of the Bromeliad Society, a non-profit corporation organized in 1950. The Bulletin is issued six times a year. Subscription to the Bulletin is included in the annual membership dues. There are four classes of membership: Annual, $4.00; Sustaining, $6.00; Fellowship, $12.00; and Life, $100.00. All memberships start with January of the current year. For membership information, write to Mrs. Jeanne Woodbury, 1811 Edgecliff Drive, Los Angeles 26, California. Please submit all manuscripts for publication to the editor, 647 South Saltair Avenue, Los Angeles 49, California. T IS INTERESTING TO NOTE that the inflorescences and foliage of bromeliads are making their way into Japanese flower arrangements. At a recent exhibition of flower arrangements held at the Onomichi Botanical Garden in Japan several uses of bromeliads were in evidence. 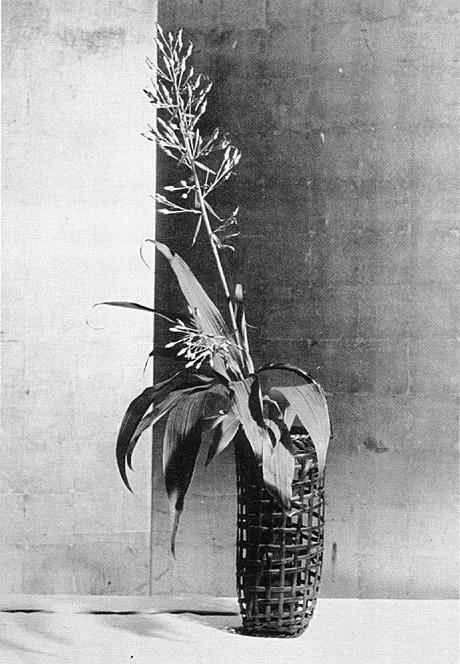 The above photograph furnished by Dr. Hiroyuki Murata, Director of the Garden, shows an arrangement made by Mrs. Isen Yamamoto, using the flower stalk of Portea petropolitana var. 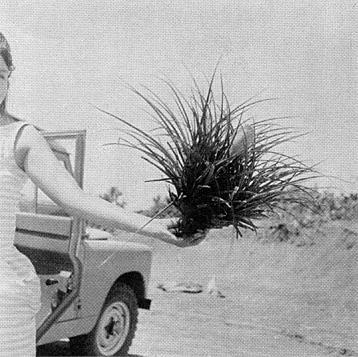 extensa and the foliage of Pitcairnia corallina. ANDWICHED BETWEEN PERU AND COLOMBIA lies a little piece of land, Ecuador — a country that fairly bursts with bromels. I arrived in Guayaquil, Ecuador, on June 1961, scarcely knowing what a bromel was other than that the family included the pineapple. 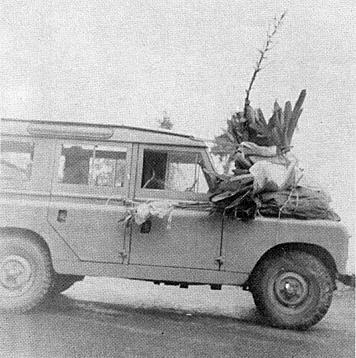 But from the first excursion made in July, 1961, bromels had captured another follower, and I have been following them ever since. Sundays often find the family on a trip to the coastal deserts some 100 miles from our home in Guayaquil. When several days are available, a leisurely trip to the Andes, about 80 miles from Guayaquil, is convenient. A six-day trip was made to the Ecuadorian Oriente with my husband and one of my botany students from the University of Guayaquil's School of Natural Science. The area on the eastern slopes of the Andes and pertaining to the Amazon River basin is called the Oriente in Ecuador. On any prospective trip to the "campo" musts are note book, plastic labels to put on the specimens immediately upon collection, a collecting stick, a coil of rope, and plastic bags. The four children and their father are pretty philosophical about having to peer through and around leaves and flowering spikes, but even with this cooperative attitude some plants are just too big to collect whole. My interest is solely botanic and no effort is made to collect more than the two or three plants needed for photographs, examination, drawings and determinations. 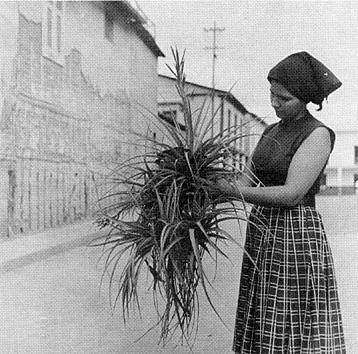 As part of the problem in identifications, very frequently plants have to be brought back from the "campo" to be kept in Guayaquil until they have flowered. At times there are on the cement walls around the house as many as 20 to 30 different types which have been collected and are awaiting the completion of the life cycle. Not always is this successful. A very large Tillandsia from the Andes at about 6600 foot altitude has never yet been successfully brought to flowering. Others collected in the Ecuadorian Oriente, for example Tillandsia zamorensis, were brought back all the way to Guayaquil and did complete their cycle. The variety of types of bromels in this small country is of course related to the existence of the many climate types found here. Starting at the coast, which has annual precipitation between 1 and 30 inches one finds: 1) a dry desert, 2) the cactus-deciduous forests of Ayanque, and 3) a moist forest with "Tagua" or ivory nut Phytelphas macrocarpa and bamboo. Inland there are the thorn forest and the savanna. Next there is a tropical deciduous forest where the precipitation is about 44 inches a year and falls between December and June, with large Ficus, Triplaris, Vitex, and many vines of Bignoniaceae. Driving from Guayaquil to the start of the ascent of the Andes is some 135 miles on the road through Quevedo. There is a great deal of cultivated land with coffee, cacao, and banana. As one climbs the Andes, first one encounters a rain forest with the typical large trees, such as balsa and many tree ferns. Higher is the cloud forest with a scrambling cane which at 9,000 to 10,000 feet opens out onto the Paramo, the high Andean grassland with occasional Agaves showing above the low shrubs and predominant grasses. The eastern side of the Andes has much the same general type of vegetation in appearance as does the western slope. On the coastal area several different types of plant associations exist. What I have called the "Ayangue cactus-deciduous forest" is outstanding for its number of bromels. The heavy fogs or "garua" that sometimes fall on this semi-desert apparently are the crucial factor in the success of these bromels. One can stand in one spot not far from the little fishing village of Ayangüe and every small tree and every shrub as far as the eye can see seems to be so full of bromels that to the uninitiated they would seem to be bromeliad trees. The cactus themselves sometimes have epiphytic bromels. Some of the species are Tillandsia disticha; T. kunthiana var. divaricata, a pink bracted much lepidote, long scaped epiphyte; and T. recurvata, which was also found in the Oriente. North of this semi-desert is the Manglaralto sub-tropical rain forest of the Colonche hills with heavy rains and "garua" for 4 to 6 months of the year. This association comes down almost to the ocean and extends for 10 miles along the coast. The most beautiful bromel growing in this area is Tillandsia cyanea, a lovely small pink bracted species with large purple petals that is much appreciated in Guayaquil and is sometimes sold by the Ecuadorians in the street for one sucre or five cents a plant. Here also is found growing both terrestrially and as an epiphyte low in the trees from ground level to 14 feet up, Aechmea mexicana, over a yard tall with its whorls of broad leaves extending up to a yard and a half in diameter. Near the coast and some 45 miles north of Manglaralto, Cerro Monte Criste, a hill of volcanic origin, rises abruptly from the surrounding desert to some 1,600 feet. The altitude is sufficient to intercept the moisture laden winds coming off the ocean which are precipitated in the form of "garua". The "cerro" or mount is a veritable oasis in the midst of the flat, dusty plain. Large, luxuriant trees, balsa, Tagua, Cinehona (quinine bark tree) and of course many epiphytes, orchids, and bromels all unite to give the aspect of a rain forest, although here it is not so much a rain forest as a "garua forest". Many of the same species that are found south near Manglaralto are also found on Monte Criste. In addition there are Guzmania eduardii, G. teuscheri, Vriesea heteranda. The fragrant tiny white flowered Tillandsia multicaulis var. decipiens is also found on the Cerro but only at 1,000 feet and lower on the eastern drier side where the "garua" falls. A trip to the Ecuadorian Oriente in February, 1963, involved driving across the Andes from Guayaquil to Cenca thence to Loja, Zamora, and Cumberaza. The last named is a small village on the river Zamora and the end of the recently completed track designated as a road. From there we traveled by canoe some 40 miles down the Zamora River collecting at several places on the way. The return trip by mule was more effective because of the greater ease in stopping to get any specimens. We found Tillandsia zamorensis and Aechmea drakeana with its magenta colored ovaries. A very rich collecting area and one easily accessible is on the western slopes of the Andes between 1,000 and 10,000 feet altitude. In the lowlands growing in many orange trees as well as in the natural forest is the striking red bracted Guzmania monostachia. At 1,000 feet one finds Tillandsia cyanea. As the altitude increases concomitantly seem to increase the size and abundance of the common bromels. At 6,600 feet many of the trees take on the appearance of "bromeliad trees" similar in appearance to the photograph by Kubisch in the Bromeliad Society Bulletin XIII (1):10. Tillandsia complanata, with every variation in leaf color from pure green through striated to red, is very common between 6,000 and 8,300 feet. Guzmania gloriosa with a scape 24 inches tall was collected at 8,900 feet growing on a road cut. At 10,800 feet, which is at the edge of the Paramo, the bleak high grasslands of the Andes, Tillandsia deppeana was found with a spike 72 inches long. These are just a few of the species that have been collected and documented so far. Ecuador, in spite of its small size, has a very impressive number of bromels. The rapid changes in climate within a short distance produces a variety of habitats that enable many different species of bromels to survive and flourish. — Casilla 5951, Guayaquil, Ecuador. V. I. P.'s attending the opening of the Greater New York Chapter of The Bromeliad Society. 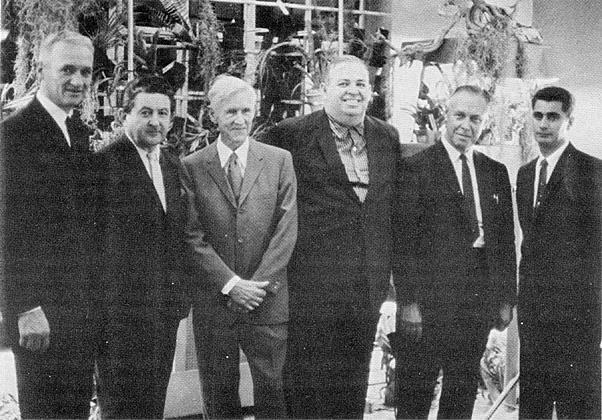 From left to right: Frank Turek, of Julius Roehrs Co.; Walter Singer, of the New York Botanical Garden; Mulford B. Foster, of Orlando, Florida; Dr. George Milstein, founder of Chapter of New York City; George Kalmbacher, of the Brooklyn Botanic Garden; Robert Russo, of the New York Botanical Garden. HE NAME IN THE NEWS THESE DAYS is Dr. George Milstein, who has been responsible for the formation of the Greater New York Chapter of the Bromeliad Society. A great bromeliad enthusiast, it was he who exhibited the prize winning display of bromeliads at the New York flower show in 1963 and it was he who single handed organized the bromeliad growers in his area. The opening meeting of the new chapter, held on October 2, 1963, was a tremendous success, more than seventy persons crowding into Dr. Milstein's New York apartment. Many notables in the local horticultural world attended, but the biggest surprise of the evening was the arrival of Mr. Mulford B. Foster, original president and editor of the Society, who traveled all the way from his home in Orlando, Florida, to be present. During the meeting, Dr. Milstein showed a series of colored slides of bromeliad specimens and answered questions on culture and growing these plants in the home. The second meeting was held on November 5, 1963, in the library of the New York Horticultural Society, at which time more members joined. A talk "Tillandsias — Part 1" was given by Dr. Milstein, who illustrated his lecture with films. 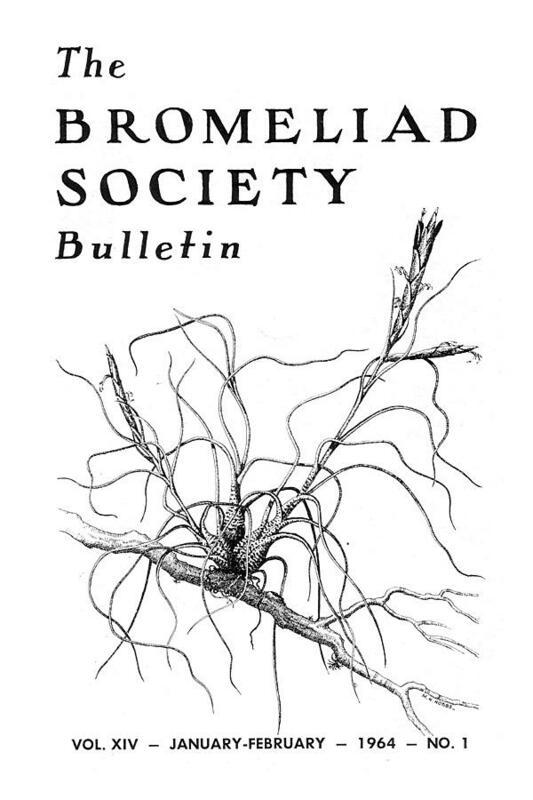 The group is getting off to an auspicious start with the publication of a monthly news sheet, entitled The Bromel-Ana, which features a "bromeliad of the month — a complete description with illustrations of a particular bromel. Many noted authorities will contribute to this little paper. Those interested in joining this chapter or attending one of the meetings should get in touch with Dr. George Milstein, 8502 Fort Hamilton Parkway, Brooklyn 9, Telephone Shore Road 5-4228. Just received from The Louisiana Bromeliad Society is their year book for the coming year. This book, with a lovely cover designed by Mr. Morris Hobbs, contains the names and address of the members, the names of the officers and meeting places for 1964. This group, limited in membership, is very active, numbering among its members some of the leading bromeliad growers in the United States. Both the Bromeliad Society of Australia and the Bromeliad Society of New Zealand publish newsletters in order to keep their many widespread members informed of their activities. The Bromeletter of Australia is an especially ambitious project, which in time should be a distinct contribution to the literature on bromeliads. The main problem bothering both societies down under is a clarification of nomenclature. The Bromeliad Guild of Los Angeles has for its project this year the sponsoring of more colored illustrations for the bulletin. It was this chapter who was responsible in the first place for the introduction of color into the bulletin, holding special auctions at each meeting for this purpose. As Los Angeles was the original home of The Bromeliad Society, interest in these plants runs high. As membership in the Guild is limited because meetings are held in homes, two other groups have been formed — one in the east side of the county and one to the southwest. More information about these groups will be given later. Mr. Fritz Kubisch has been a leading force in their formation. The Florida West Coast Bromeliad Society, which holds its meetings in or around St. Petersburg, has an ambitious program for the coming year — the interest of this group being in the exhibiting of bromeliads at local flower and orchid shows. this is the last number of The Bulletin you will receive! VER SINCE I STARTED COLLECTING BROMELIADS twenty years ago, Nidulariums have been my special pets. From the very beginning, they proved to be highly satisfactory plants in every way: they required no special coddling; they never got scale or were nipped by snails; they thrived in darkened areas—usually under the bench—where no other self-respecting bromeliad would grow; they were not fussy as to soil; and they were hardy enough to be grown outdoors in planters or under trees. Despite all the neglect and unkind treatment my Nidulariums have received, they have always been handsome plants, have been dependable bloomers, and have rewarded me with many offshoots. Nidulariums, probably for these reasons, have long been favorites in Europe, and the American will notice many lovely hybrids in florists' windows. These bromeliads, growing in their native habitat close to the ground on old trunks or stumps, were easy to collect, and so were among the first bromeliads introduced into cultivation. The genus is not a large one; there are only about thirty species, all being endemic to Brazil; but much has been done in the way of hybridizing and a large portion of the two dozen or so varieties listed in catalogues are hybrids of European origin. 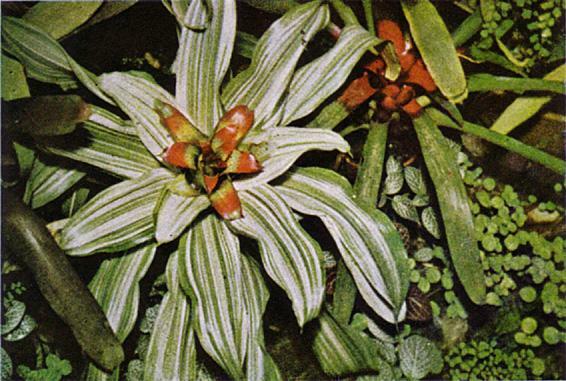 Nidulariums are characterized by their collar or rosette which forms in the heart of the plant just prior to blooming. The inner cluster of foliage usually turns a brilliant rose, cerise, red, or maroon, and stays in color for many months. Unlike the blushing heart of the Neoregelia, in which all the leaves become suffused with color, the brilliant shading in the Nidularium is restricted to its collarette of leaves. The name Nidularium is taken from the Latin nidus, meaning nest, which refers to this formation of leaves. The Nidularium is a handsome plant whether in bloom or not. It varies in size from a foot to three feet in diameter, but seldom exceeds one foot in height. The leaves are usually of soft texture, finely toothed, and vary in color from green to dark purple and may be plain, striped, or spotted. Nidulariums have rather large spines, but these are not stiff. Like the Neoregelia, the flowers appear deep in the center of the heart; in only a few instances does the inflorescence rise up from its nest. In most species the flowers, which range in color from red, white, and blue, do not open even though in full bloom. Nidulariums are not difficult to grow if one keeps in mind that they like to be kept on the dark and damp side. For this reason, they are not too happy as house plants, where the atmosphere tends to be dry; but they can be brought into the home when they start to show color and brighten the coffee table for several months. They seem to thrive in any compost. Nidularium innocentii (so called because of the white flower) and its several forms are old-time favorites. N. innocentii var. wittmackianum has plain green leaves. The inner cluster turns red at the tips, making a pleasing contrast to the white flowers. N. innocentii var. lineatum is a handsome bromeliad similar in all ways to the type plant except that the leaves are finely penciled with longitudinal striping in clear white. (see illustration) N. innocentii var. striatum is also similar, except that the leaves are more broadly striped lengthwise with yellow-ivory. Two Nidulariums that are often confused are N. amazonicum and N. purpurescens. Both are large and showy plants, and their dark color makes them striking subjects when grown with plain green plants. The leaves of N. amazonicum are a deep metallic purple suffused with green. At blooming time the inner rosette turns a brick red—a startling contrast to the white flowers. There is a miniature form of this, which I purchased abroad. This little gem seldom exceeds a foot in diameter. N. purpurescens has broad metallic green leaves suffused with purple and glossy purple beneath. The center bract is red tipped. The flowers are white. N. regelioides was formerly known as N. rutilans. This attractive plant is popular because of its compact size, seldom measuring a foot and a half in diameter for me. The wide dark green leaves faintly spotted with a deeper green surround a rose rosette. Flowers are a deep orange. This plant has withstood temperatures to 32 degrees in my garden. Nidularium fulgens (see illustration) always makes a perfect rosette of delicately spotted leaves, which with its prominently serrated leaves commands attention whether it is in color or not. The glossy light green leaves flecked with darker green spots is especially attractive in spring when dark blue, white edged flowers appear in the flower head of brilliant cerise bracts, which later turn pale lavender. Nidularium billbergioides is outstanding for its flower head which appears on a long stem from six to eight inches above the center of the plant. Its flowers are white and the bracts are orange, while the leaves are a soft green. This is an attractive small plant. There is a form called citrinum, in which the secondary rosette is a bright yellow. Nidularium × 'Francois Spae' is a handsome large plant with broad green leaves which originated in Belgium. Its inner collarette of rose lasts in color for many months. There is a variegated form of this cross. 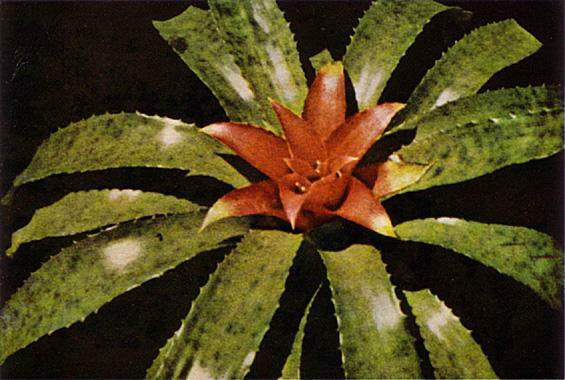 Nidularium splendens is the name of another bromeliad brought from Europe. Whether it is a cross or species, I do not know. But I do know that it is a very pretty rather slender green leaved plant with an attractive rose-colored inner rosette. It seldom is more than a foot or so in diameter but will attain a height of about a foot. Nidularium × 'Casmir Morobe' is one of the finest of all the hybrids. It is a large plant, a vigorous grower, and generous with offshoots. Its wide green leaves faintly dotted with darker spots make a handsome background for the handsome rosette of rich rose. It appears to be hardy here outdoors, its bright rosette lending color to an outdoor planting for many months. It lasts equally well in the house. Nidularium × 'Mme. Robert Morobe' is my most stunning cross. The leaves are two toned — the upper side being a lovely soft green, spotted with a deeper shade, while the underside is a rich purplish maroon. The leaves are prominently toothed. When in bloom, the plant is a dazzler with its vibrant cerise collarette. Nidularium burchelli is different from all the rest in that it likes to climb. The leaf rosettes are dull purple-red and grow up from the slender wire-like extensions of the base at intervals of every few inches. It has a dense flower head of orange-yellow. It can be grown either in a pot or on a raft or basket. E ARE CONSTANTLY EXPERIMENTING with different ideas and methods that come to mind in order to formulate still more successful systems of growing bromeliads. Since we grow hundreds of a certain type of epiphytic tropical in polyethylene food containers and have developed a revolutionary technique which gives us exceptionally rapid yet sturdy growth, increased flower production, and larger flowers of better substance, we figured that, with a few modifications, the basic idea would work in a similar way on our Aechmeas. The plants chosen for our experiment were all very tough-leaved Aechmeas, such as Ae. amazonica, a cross of this species and Ae. chantinii, and a group of Ae. fulge-chantinii—a remake of an old hybrid that this time shows barring like that found in the straight species, Ae. chantinii. All of these seedlings were growing in two-and-a half-inch pots and were about ten inches or so in spread. We were eager to bring these seedlings to maturity as rapidly as possible and to bring out the beautiful markings and colors inherent in the plants. To attain both of these objectives would be progress—to attain large, rapid growth with a loss of colors and markings, or vice versa, would mean only disappointment and failure with this cultural method. Plants are grown in optimum light. We use clear (slightly milky) polyethylene food containers instead of the conventional clay pots or plastic pots. We place only two holes for drainage on opposite sides of the containers about one-quarter inch, or slightly higher, up the sides; none in the very bottom. We keep this reservoir, thus formed in the bottom of the container, filled with water. We use new fir bark—one fourth to one-half inch grid—for a growing medium. We use only very little fertilizer and preferably one of an organic nature, such as fish meal. We grow these plants on top of a bench or on the ground rather than "plunged in." If you follow these points to the letter, I am sure that you, too, will be satisfied with the results in even a very short time. But, perhaps I should clarify further these seven points: Let me explain that for firm growth on any stepped-up program, added light is a necessity. Grow your plants under almost clear glass, saran cloth allowing only minimum shade, or under clear, corrugated fiberglass. Watch for signs of over-exposure to sunlight during the first week or so, especially if your plants were soft grown previously. By all means provide very good ventilation to counteract a possible heat build-up if you grow your plants in some type of enclosure. The quart-size food containers are preferred for seedlings out of two-and-a-half-inch pots. Incidentally, we have found it better to break away the pot from the root ball of this sized plant rather than to pull or cut it out. To facilitate the whole operation further, we water the seedlings well and permit them to drain a few minutes. 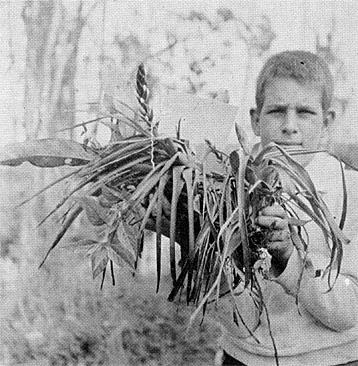 Then we hold the plant in the palm of the left hand and strike the pot with a small hammer or a potting stick of the type used by orchid growers. Strike lightly, though, and only hard enough to crack the pot. Rotate it a half turn and strike again. Soon all of the crock will fall away or can be picked off. You will notice only the very minimum of root damage if you waste the pot this way rather than try some other means of removing the plant. The holes you make in the container into which you will place the seedling can be made with a hot poker or with a very sharp pointed knife, twisting slightly at first to gouge out a small hole. Continue twisting the knife, cutting a larger hole until the hole is almost a quarter of an inch in diameter. Remember to place the holes on the side of the container and not in the bottom, so that a reservoir for holding liquid is formed in the bottom. Placing the holes in the bottom would allow the water and small food solids to drain away or to clog the holes. This reservoir is the greatest feature of the whole system—without it you will gain nothing, though you do use plastic containers of any kind. The smaller fir bark, not the dust, is the best grade to use, as it permits better capillarity and aeration, two vital processes to the health of epiphytic plants. Recall that in point No. 5, I specified "new" fir bark. This bark has a supply of food that will give the seedlings a fine start. I never purchase any of the "used" medium sometimes sold by orchid growers. Not only is used fir bark deficient in nitrogen, but also it just might harbor some disease organisms that could attack bromeliads. I have seen fir bark, osmunda, and other media used for potting Aechmeas and other genera that had been previously used for Cattleyas, which had a virus disease. Believe it or not, the Aechmeas later developed "color breaks" and distortions in the pattern of their leaves similar to those markings on the diseased Cattleyas. Now, whether Aechmeas or other bromeliads actually become hosts to the same virus diseases that attack orchids, I cannot say with authority, as I did not examine closely any of the Aechmeas involved. Casual observation of similar symptoms was enough to convince me that one must be very careful of possible contamination. I avoid all used materials unless I have used them myself and know that those plants in which these media were used are clean and healthy. Regarding the use of fertilizers, I recommend that you use only organic types, such as dried fish meal, cotton seed meal, etc., at the rate of only a quarter of a teaspoonful for the quart containers every two weeks as a start. As growth progresses, the rate can be increased. Inorganic fertilizers are not advised for these seedlings at this time, because they, like animal manures, can burn roots if they come in contact with plant tissue in an undiluted strength. Then, too, an excess tends to "green up" certain bromeliads even if it does not burn the plants. Don't be misled to believe that I do not recommend manures or commercial fertilizers for bromeliads; I am merely stating that dried fish meal and cotton seed meal gave better results in this particular program. As a check, we withheld all fertilizers from a few of these Aechmeas and noted that they grew almost as rapidly as those given supplementary feeding. Their leaves were even more brilliantly colored, but growth was slower after the third or fourth month, indicating clearly that the supply of nitrogen in the bark was on the wane. Supplemental feeding became a necessity at this point. This plastic container method of growing the above-mentioned Aechmeas has given us outstanding results for over two years now. We can pass it on with complete confidence that it will work as well for you. Give it a try! And let us hear of your results. URING THE WINTER WE WERE INVITED by two bromeliad growers to inspect their glasshouses where the plants were said to be sick. Observation showed a browning-off in the cups of many plants, which appeared alarming to say the least. Most plants were also lacking in luster and vigor—some were dying from the outside in, and some from the inside out. Upon entering these glasshouses, particularly one which was lined with polythene sheeting, we noticed that the atmosphere was almost foul. It was stifling, stale, and overheated; no air whatever was allowed in and the door was carefully kept closed The second house was larger, but the conditions were the same as in the smaller one. These people were afraid to ventilate in case cold air would damage the bromeliads. Advice was given immediately to open vents and keep them open, except in the coldest winter weather. Particularly at night, the moist sea breezes should be allowed to circulate freely. It is too soon to note any change in the health of these bromeliads, but in the writer's opinion, the plants not "already on the way out" will show a marked improvement in a couple of months. From about latitude 34 north — from Sydney north — bromeliads will thrive in the open if sheltered from high winds and direct sun, and the coddling as described above can only be dangerous. Another interesting comparison was noted by the writer in two separate bush houses. One had slats all around the walls, with an iron roof—the bromeliads were not happy. The other had slats on the roof which allowed filtered sunlight and rain to enter, and the walls were glass. In here, the plants were grown hard and healthy, and these came through the winters without artificial heating. It is not suggested that the latter idea is best, as some Vrieseas and Guzmanias may not be happy under such rugged conditions, but it could serve as a guide. It is noteworthy that the bromeliads in the latter house showed remarkable color, especially Aechmea orlandiana, which was almost all black, and Aechmea fasciata, which was a lovely pink in the foliage. —W. B. Charley, Mt. Tomah, Bilpin, N.S.W., Australia. N THE LAST FEW MONTHS quantities of corrugated plastic sheets have been imported into Australia for use instead of glass for hothouse culture. Just twelve months ago I erected such a house, consisting of a roof ten feet high and two sides giving me protection from the west and south from where the cold winds come. (in Sydney) Then I erected my benches two feet high and placed thereon forty plants, some of them being suckers just removed. Billbergia horrida, 27 inches high, a wonderful color, with alternate bands of mahogany and grey scurf. Billbergia × 'Fantasia', 17 inches high, a very healthy plant just showing flower, with white marking on leaf that is clear and distinct. Nidularium innocentii var. lineatum, in full flower with lovely green leaves with a brilliant center, not a blemish anywhere. Nidularium innocentii var. striatum, also a perfect specimen with leaves 10 to 12 inches long. All my other plants are big and healthy with plenty of color in the leaves. I would say they are 50 per cent better than the older ones grown under shaded glass. These plants are in four-inch and five-inch pots in a fairly rich compost, regularly watered, but no added fertilizers, and every plant has an unblemished leaf structure. The reason for this result is that the plastic allowed from 80 per cent to 85 per cent of light to penetrate to the plant but prevents the burning rays of the sun from penetrating. To members in colder climates than ours (45° minimum in winter) a totally enclosed house will be found to be 7 to 8 per cent warmer than a similarly constructed glass house, and on winter days, if the sun is out for only a few hours, the plants still get thoroughly warm. As a matter of interest, I tried fiber glass but found it not so satisfactory, as the light penetration dropped to 50 per cent within six months. —Charles M. Taylor, 142 Ernest St., Sydney, Australia. A habit drawing, three-fourths full size, of Tillandsia Butzii, a beautiful small bromeliad from Mexico and Central America. 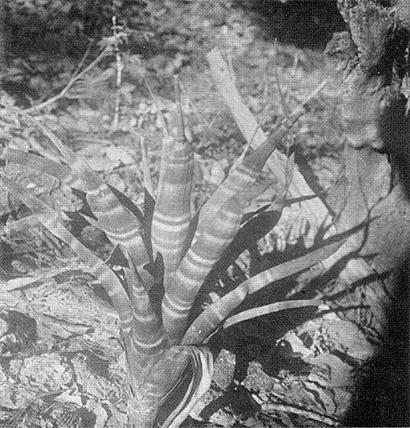 The twisted, cylindrical leaves widen out at the base to form a large pseudobulb. Small purple spots decorate the green leaves, becoming confluent at the base, which looks more purple than green. Bracts are rose, with purple petals and yellow stamens, generally appearing in early spring. N MEXICO ONLY A FEW INDIVIDUAL SPECIES of bromeliads receive common names. The species, as a group, are usually known by the "family" name "magueyitas." In association with orchids and other epiphytes, they become "parasitos." Some years ago I collected a Tillandsia which was duly catalogued with its corresponding number. The number I forgot, but I remember the plant as the "Zebra" Tillandsia. 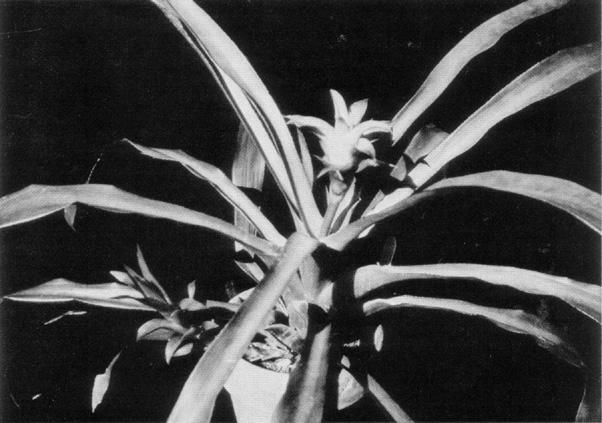 More recently it was given botanical standing as Tillandsia leucolepis by Dr. Lyman B. Smith. In his description, Dr. Smith does not mention the source of the type plant, which flowered in Oaxaca, Oax. The habitat of the species appears to be a very small area, so perhaps it is better it be not known too precisely. However, for the sake of the record, it is here given as San Juan La Jarcia, Oax., Mexico. N A CATALOGUE OF THE CALIFORNIA JUNGLE GARDENS, Nidularium chloro-marichelli is described as a plant of compelling beauty. For a discriminating plantsman, such as David Barry, Jr., to write with such enthusiasm is enough to convince one of the desirability of this Nidularium. While of fair size, it is not a bulky plant and is only about a foot high with a low but graceful spread of two feet. As with most of this genus, the flowers themselves are inconspicuous, but the surrounding leaves are suffused with a clear bright rose. Exotica describes this as magenta-red, and possibly it is on one of the color wheels which often have peculiar designations so that the name does not "sound" as the color "looks." Assuredly, magenta-red does not sound attractive, but the color possessed by this plant certainly is most pleasing. The entire plant is a delight with its light, bright green foliage and artful carriage giving an air of "joie de vivre." The blushing of the inner rosette is both arresting and long lasting. Being a sturdy grower, it is generous with off-shoots, producing eight or nine. Quite apart from its handsome inflorescence, its general refinement and elegance make it a first-class plant. It is of the easiest culture and it tolerates temperatures as low as 37° F.
Virtually all the means of growing bromeliads will with some modifications prove satisfactory in arid areas. The only exception would be those plants which are placed directly on branches without any moss or osmunda. The Hawaiian tree fern fiber, Hapuu, is quite open and dries out quickly unless a top dressing of sphagnum moss or some such material is applied. If the plant is plunged in a moisture-retentive material, such as sand, volcanic rock or bark, this will also help retain adequate moisture. Rather than to bother determining which medium may be best for the plant, it might well be better to determine which is preferable to the grower! If one enjoys daily fussing with his plants and is apt to over care for them, it would doubtless be better to use a medium which is more open. Where one's activities are chiefly of the week end variety with a mid-week watering during the height of summer, then a more moisture-retentive medium is desirable. Osmunda is ideal as a growing medium; its one drawback is that it is expensive. Crushed volcanic rock, which is full of air holes and has a texture that is coarser than that of coke, has proven to be good for most bromels. The only disadvantage is that it is heavy if one hangs the pot. Conversely the weight helps to hold a small pot upright when the plant otherwise might tend to be topheavy. One of the most satisfactory of covers for plants is the clear or translucent type of fiber glass. While the colored fiber glass is cooler and more desirable for human comfort, only a few plants will grow under it. The white, or snow, type also blocks out too much light. The clear admits more heat along with the light and is therefore less desirable where human comfort is the prime consideration. The corrugated type is easily fitted and is the strongest offered. The best grade costs about 75 cents a square foot, but it is easily sawed, nailed, and is shatter-proof — an important consideration for some situations. Just as it excludes much heat, it also keeps out some frost. Unfortunately, it will erode, especially under our fierce sun. My patio has been covered with fiber glass for eight years and shows considerable wear. Possibly it will hold out four or five more years. Where formerly, the corrugations held up when walked on (where there was a 2 x 6 undersupport of egg-crating) it now buckles. Lately some companies have guaranteed their product for 15 years. I have found that the strong light admitted by fiber glass permits the coloring of those bromeliads that require it, without fear of burning unless foliage is too close to the surface of the glass.